We got there right as they opened and pretty much had the place to ourselves. I love that almost every seat in the house will give you a view of the kitchen. I love watching what’s happening. As we sat and began to check out the menu they brought out these super addictive roasted chickpeas with smoked paprika. So addictive that we asked for seconds. 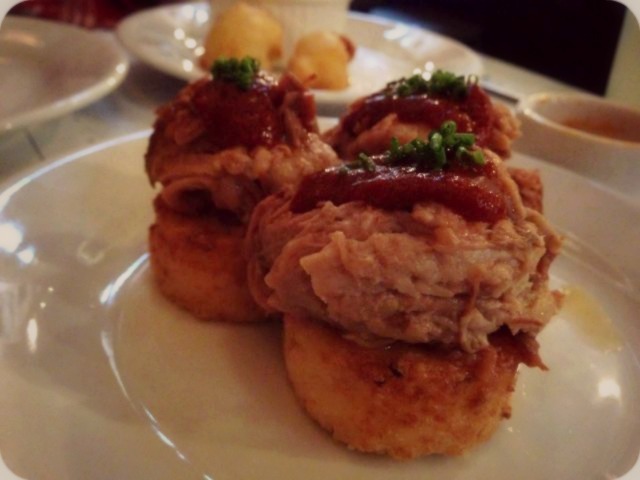 From the Happy Hour Menu we chose the Cauliflower Fritters and Pork Shoulder on a Grit cake. I was hoping that the cauliflower fritters were going to be more of a patty type dish, instead they were battered and fried cauliflower. Don’t get me wrong, they were good, just not what I was expecting. 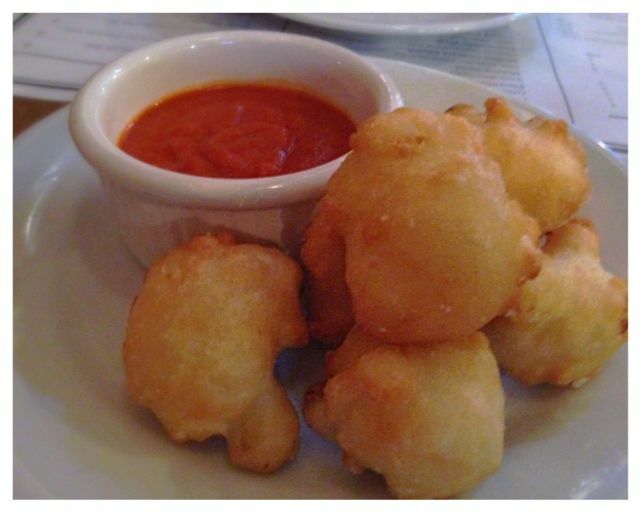 They were served with a bravas sauce, which is a spicy Spanish tomato sauce. Since cauliflower doesn’t have a ton of flavor on it’s own, this dipping sauce was a great addition. The Pork Shoulder was done really well and presentation on these were great. I love grits or polenta as some call it. The pork was very tender, flavored well and topped with just a little sauce. We would order these again for sure. They have something similar on the dinner menu, but the gal said she liked the appetizer version a little better. For dinner I ordered a big bowl of chanterelle mushrooms. 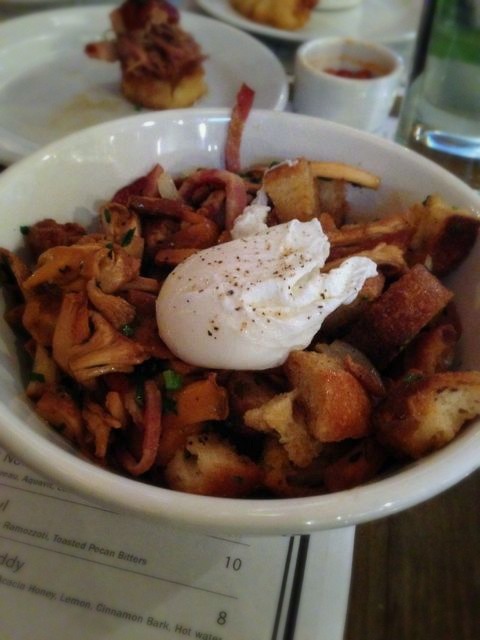 It was loaded with muschrooms plus bacon, herbs, croutons and a poached egg on top. It was incredibly savory, and I did love it, but……. it was almost too much of one thing. I would suggest sharing this with someone along with another entree. It reminded me of stuffing, in a really good way. 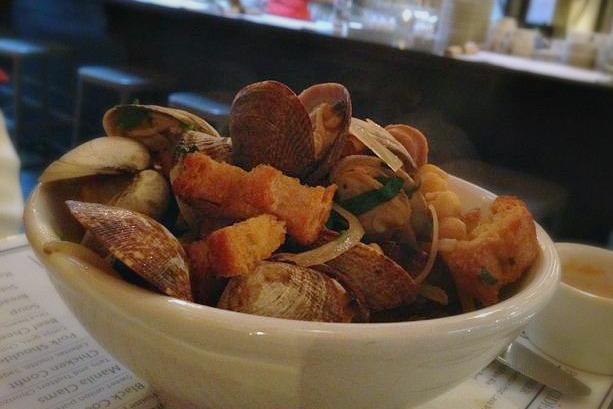 My husband ordered the Manila Clams with the Tails and Trotters chorizo, chickpeas and croutons. This was also really good. I did take more than I probably should have, considering my husband doesn’t like mushrooms, so he didn’t want any of mine. Good thing his was a pretty good sized serving. Their brunch menu looks good too and I would love to come back and try that some time. Atmosphere is quite cozy in this industrial/rustic space. Service was really good. We were early and it wasn’t busy, but they were helpful and knowledgeable about the food, which I always appreciate. Prices were $4-$5 for appetizers and Happy Hour drink specials and $9-$12 for dinner entrees. They had beer, wine and cocktails. Radar is located on Mississippi Ave.